A new study by the WWF (Seafood and the Mediterranean: local tastes, global markets) suggests that The Mediterranean EU countries - Croatia, France, Greece, Italy, Slovenia, Spain and Portugal are among the largest fish consumers worldwide, and that more than 93% of assessed fish stocks in the Mediterranean itself are threatened by overfishing, and face an uncertain future. If we don’t take serious steps to protect the remaining fish stocks, the Mediterranean may never recover. The region has an annual average consumption of 33.4 kg of fish per person, compared to the global average of 19.2kg, and that’s almost twice as much as 50 years ago. Portugal's average is the highest at 56.8kg (more than a kilo of fish per person every week) The figure for Greece is 19.6kg, of which 66% are imported (mostly from the developing world), 22% are domestic aquaculture products and 12% are domestic fisheries products. 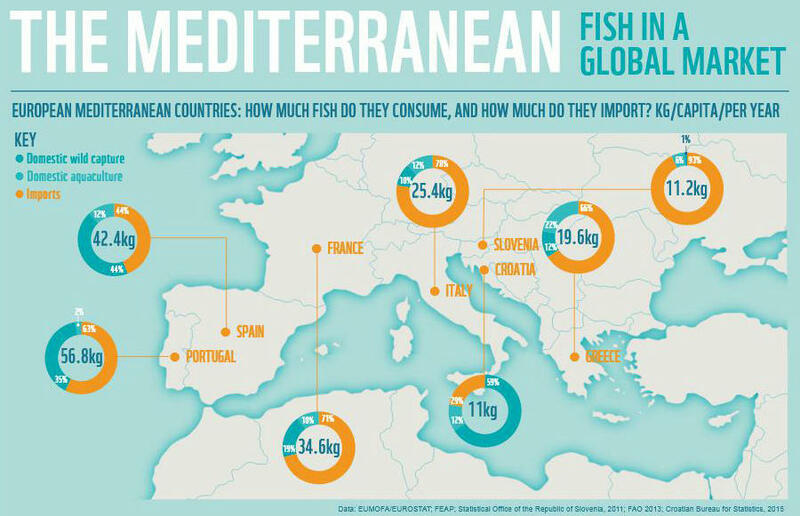 Fish-lovers in the Mediterranean are in fact key players in a global market, and their buying habits have global impacts. It’s really important that consumers understand the significance of their choices. European Mediterranean countries account for 36% per cent of all fish imported from outside the EU - nearly 5 million tonnes every year! When it’s responsibly managed, aquaculture can be an excellent and environmentally friendly alternative that takes pressure off wild stocks, benefits communities, and makes an important contribution to national nutritional needs. Aquaculture currently produces around a third of total fish landed (by volume) in the European Mediterranean region. In Greece and Italy, it actually exceeds wild capture – this mirrors the global situation, where more than half of all fish consumed comes from aquaculture. Educating consumers about their choices is central to saving and restoring fish stocks in the Mediterranean and beyond. • Try something different to reduce the pressure on the most popular stocks. These are the foundations of WWF’s multilingual Sustainable Seafood Guides - Sustainable Seafood Guide(Greek).